In spite of the growing popularity and supply of jacketed bullets, many shooters still shoot cast bullets. 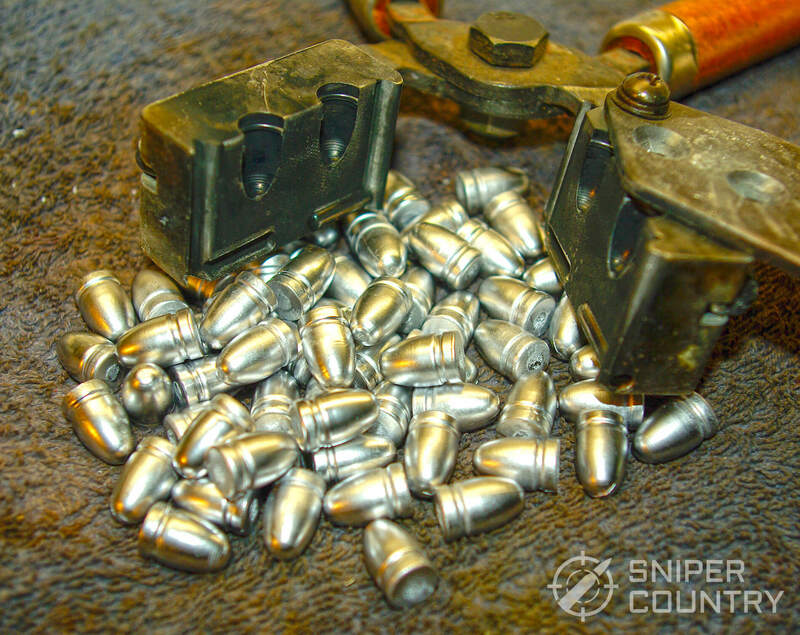 Cast bullets are easily made at home or are inexpensive to purchase in quantity, are economical, and don’t require an elaborate set-up or supply chain to produce. (My bullets come from plain old wheel weights that a friendly tire shop is glad to get rid of.) Another plus is that cast bullets you make can be very accurate, versatile and useful. I can’t remember the number of deer I’ve taken over the years (not to mention squirrels, with the right load) with my .44 and .45 cast bullets. First, A Little Background – Why Cast Bullets? What Are They? A quick explanation…all lead bullets are not necessarily cast bullets. Some are swaged in a press that forms the bullet from pure lead. These are not cast, but literally squeezed into a bullet shape. Cast bullets are made from pouring a molten lead alloy mix into a bullet mold. They are harder than swaged bullets and can be driven to higher velocities, resulting in a much better bullet for most applications. Just How Hard Is Hard-Cast? The Brinell Number Hardness (BNH) scale is a method of determining the hardness of metals. A BNH of around 11-15 is recommended for most cast bullets in the moderate velocity range. A 15 BNH hardness alloy for example would be 90% lead, 5% Tin, and 5% Antimony. Too hard is not good, either…like Goldilocks, we want the middle choice, usually around 12 BNH. For many reasons, cast bullets are viable in the hunting field, on the range and for self-defense. From mouse-to-moose loads, cast bullets have proved to be game-stoppers for many years. In the early 20th century, Elmer Keith and Phil Sharpe among others used hard-cast bullets in the development of the .357 and .44 magnum cartridges at velocities that were guaranteed to go almost end-for-end through a decent-sized deer. Elmer Keith blew up a few guns developing his heavy .44 Special loads which evolved into the .44 Magnum. 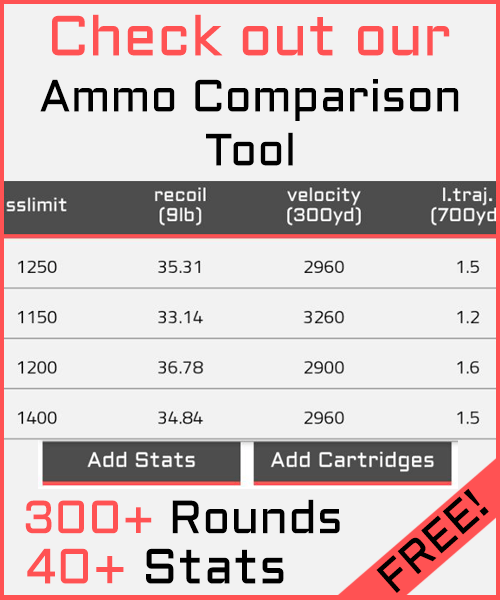 But he proved, to choose one example of his experiments, the penetrating power of a good, hard-cast .44 Magnum semi-wadcutter by shooting into a water tank after a .30-06 rifle had been shot into it and the penetration distance marked…his .44 went past the point of the .30-06 bullet and dented the far wall of the long chamber. 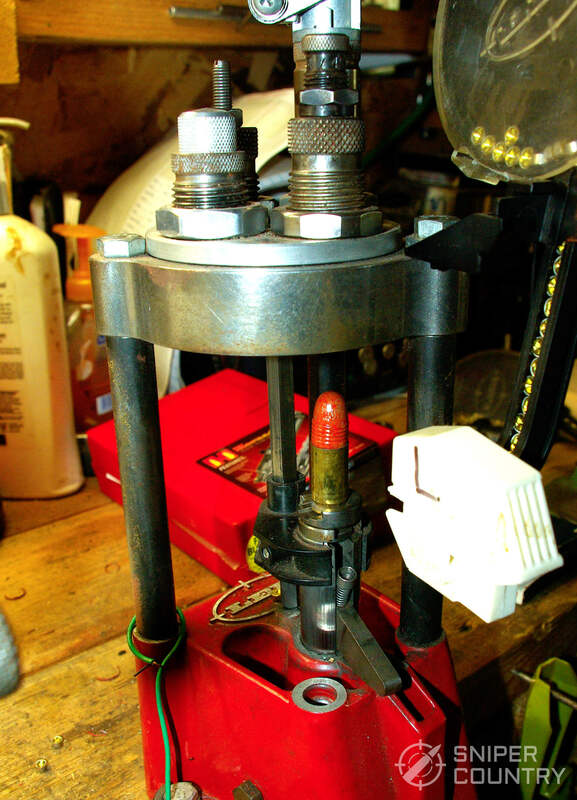 The seminal semi-wadcutter bullet he developed, the Lyman 429421, is appropriately called the Keith bullet and is still extremely popular with reloaders (Best Reloading Presses) and commercial bullet casters. Bullets poured from alloy, whether in your garage or in a state-of-the-art factory, can be problematic. One of the main issues encountered with these bullets is leading in the barrel. Once pushed past about 1000 f.p.s., you start to see strips and flakes of lead in the barrel. There are two main causes for this issue: an undersize bullet bouncing its way down the barrel and stripping off lead, or a bullet cast from an alloy too soft for the velocity. Leading is a pain to remove, whether it involves a trip to a gunsmith or not. 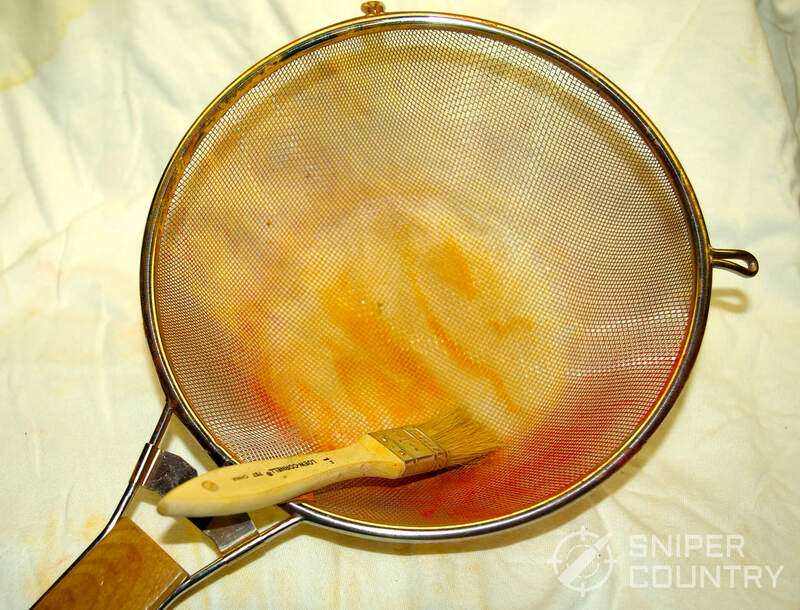 One DIY treatment is popular and usually effective – a piece of a Chore Boy kitchen scrubber wrapped around a brass bore brush dipped in Hoppe’s (Best Gun Oils & Greases) and worked back and forth in the barrel. Leading is an aggravation better avoided than addressed. There IS one way to improve upon the lowly cast bullet and its tendency to lead a barrel – powder coat it! What, exactly, is powder coating? It is coating a metal part with powdered paint using heat, and is popular in industrial applications. But, for our purposes, powder coating involves taking a freshly-cast bullet (not lubed) the right diameter and baking on powdered paint in an oven. One of the main advantages of shooting powder coated bullets is that barrel leading is greatly reduced. I’ve shot .45ACP powder coated bullets in my Glock 30 (with a Lone Wolf barrel) and have had to use nothing more than a plain brass brush and Hoppe’s with a few passes to clean the barrel, just about like cleanup after shooting jacketed rounds. When shooting plain cast, I usually have to resort to the Chore-Boy-scrubbing method. In terms of customization, you can take a bullet for one specific load and paint it one color, and paint a bullet for a second load another color. You can also combine different color powders for a truly customized look. It is economical, as well…the whole set-up to get started cost me about $40, and ongoing costs are minimal. Can Any Bullet Be Powder Coated? One initial concern about powder coating is fear about adding to the bullet’s diameter. This is not the case; the layer of paint is very thin. …here is a bottle each of red and yellow from Harbor Freight. They also sell white. 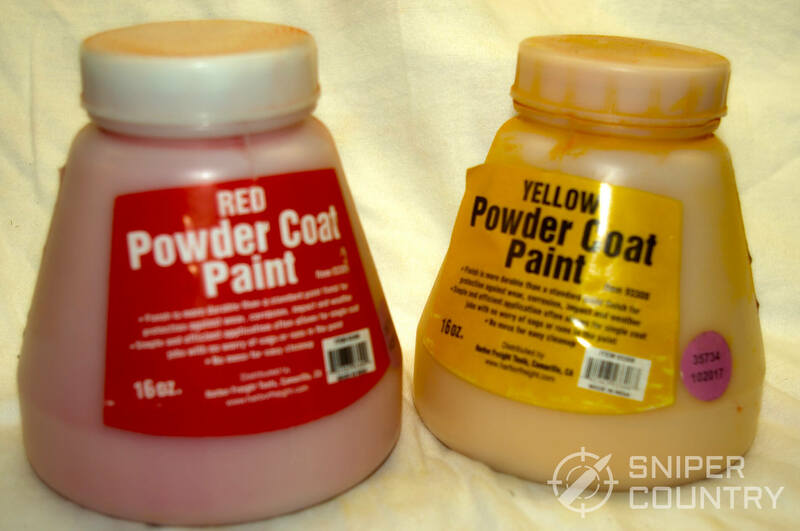 There are other brands of powdered paint out there that have different adherence capabilities, other colors, etc. but these tend to be more expensive. The plain ol’ Harbor Freight paints work for me. 2. Some sort of tumbling container. I use a couple of inexpensive snap-lid food storage containers, one for each color, but any suitable plastic container should work. 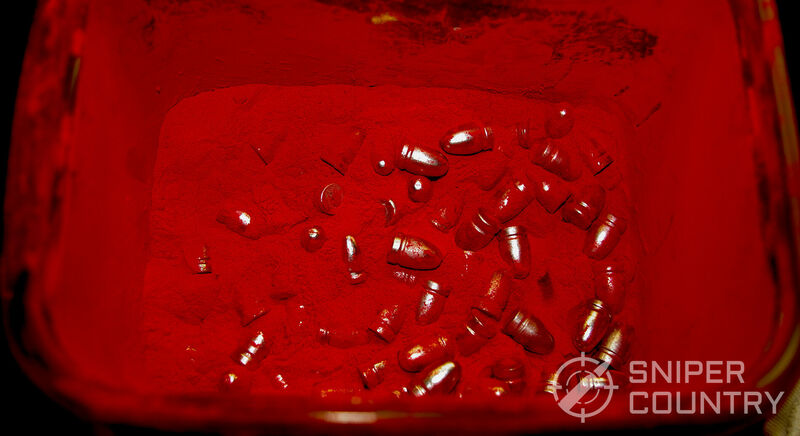 You will put the cast bullets in this and add about a tablespoon of powdered paint. Of course, the amount of powder you’ll actually use is dependent upon the number of bullets you’re coating. I find It doesn’t take much paint…a thin, even coat is best. I have good results when coating between 50-100 bullets, depending on bullet size. Don’t try to do too many-a moderate number of bullets is best. As the old commercial said, a little dab ‘ll do ya! Too much paint will put a thick coating on the bullet and could even push it past the given bullet diameter you are trying to obtain. If you are using a plastic tumbling container, the type that seems work best and creates the most static electricity (which helps the paint adhere to the bullet) has a recycle triangle on the bottom with the number five. 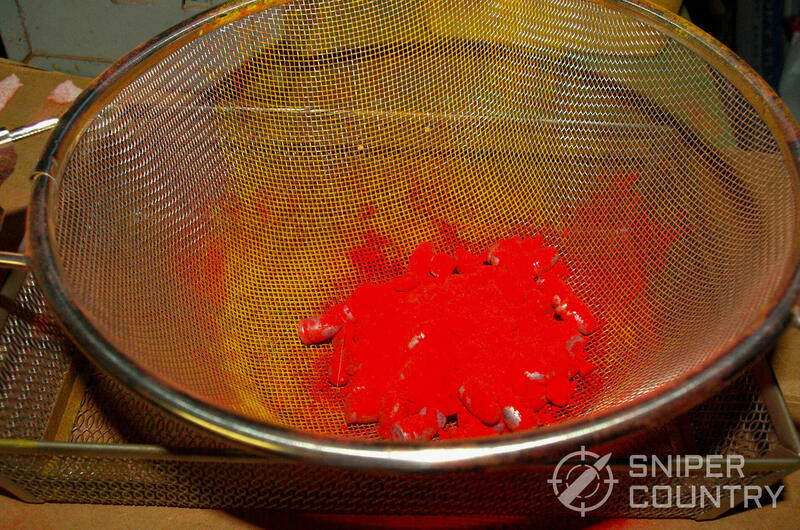 Shake, rattle & roll the container in a circular motion for a minute or two to coat the bullets evenly. A few voids with silver showing through here and there won’t hurt anything. 3. 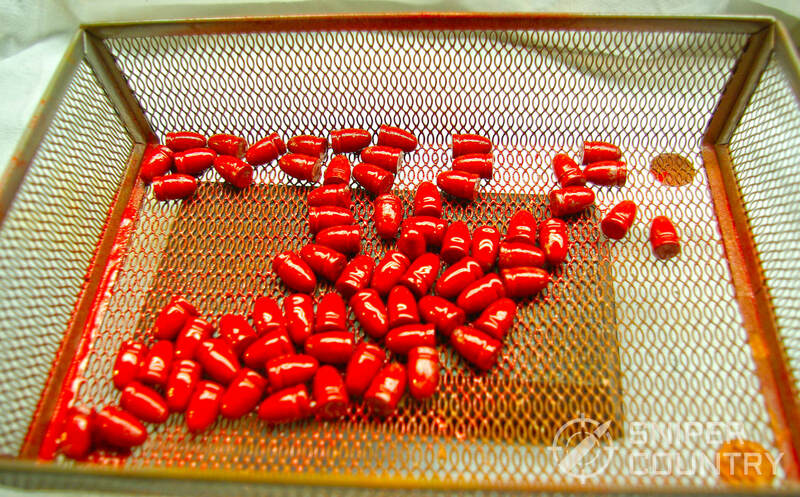 A heat-safe tray or two, to hold the bullets in the oven. These were sold as office organizer trays for $5 each. You’ll need to try to spread the bullets out in the tray – you do not want them touching or sticking to each other if at all possible. 4. An inexpensive toaster oven. 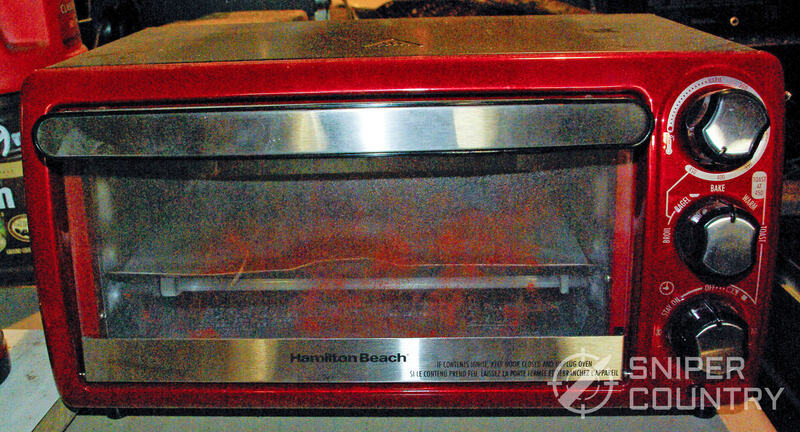 The Hamilton Beach shown here was obtained at Walmart for $25. Whatever oven you use needs to be able to get to 400 degrees for 20 minutes…that’s all it takes. A safety note…use a dedicated coating oven. Do not cook food in any oven that’s been used for powder coating. …so the loose or excess paint that falls from the bullets can land on a piece of cardboard to be reused. When finished with the process, empty the excess paint back into the tumbling container by simply folding the carboard lengthwise to make a funnel of sorts and channeling/tapping the paint into the container. As for the piece of cardboard, I use one side for red, the other for yellow…that way, the colors are not mixed. I then use a brush to remove all the remaining “clinging” paint from the cardboard into the container. I try to waste as little as possible. “Bake” for 20 minutes at 400 degrees. When timer goes off, pull tray out of oven. Obviously, it’s hot, so wear gloves! After cooling for about a minute, drop the tray gently from a couple of inches up onto a hard surface to dislodge the bullets and to break them apart. Repeat, forcefully if needed, until all bullets are loose in the tray. You may then dump them onto that hard surface to cool, or leave them in the tray once all have been loosened. The initial 60 second cooling -off period is an important step – I’ve learned this the hard way. If you remove the bullets from the tray early, you stand the chance of the paint (which hasn’t set up all the way yet) coming off in globs as it is still somewhat “wet.” On the other hand, if you wait too long, they will stick to the tray and you may have to pry them off with a screwdriver. After they cool, they are ready to load! That’s it. Pretty simple. You will have to experiment to find the right shaker container, the amount of paint needed, etc. for your needs, but this is what works for me. 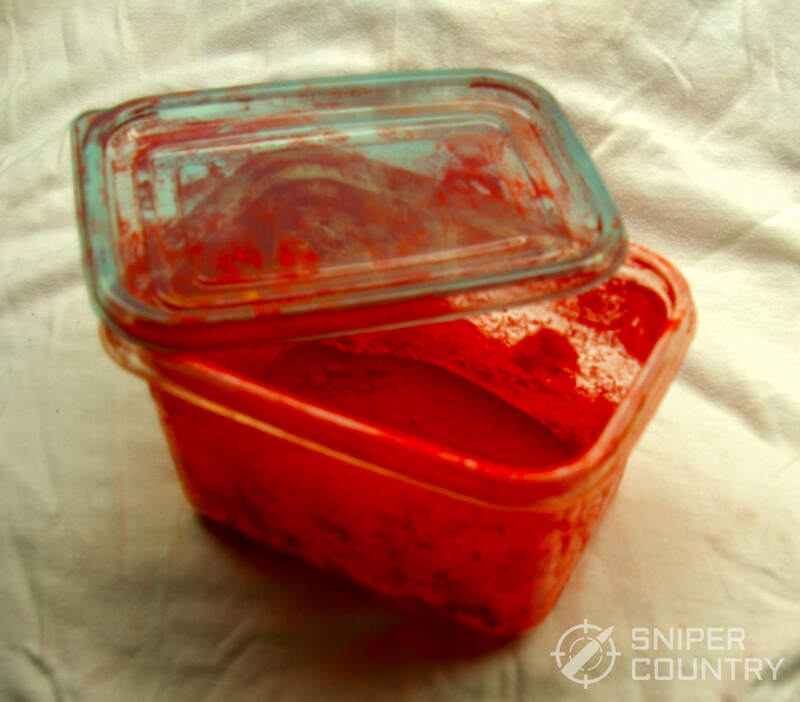 Some guys will put small plastic Airsoft balls in the shaker container with the bullets to add to the static electricity, or even use some type of spray gun to spray the powder onto the bullets…I’ve never found these processes necessary. Jacketed bullets are great, but with cast bullets you have an economical alternative that lets you custom-tailor your bullets to your needs. Full wadcutters for targets or defense, semi-wadcutters for hunting, round nose to feed in autoloaders…with powder coated bullets you can up the velocity a bit, avoid most leading and have different-colored bullets for specific rounds. One last advantage (at least the way I see it) – you’ll have “real purty” cartridges in your magazine or in your belt loops. They do catch other shooters’ eyes. They are cheap to set up for and make, very effective, allow easy barrel clean-up, and produce little to no smoke from bullet lube – what’s not to like? 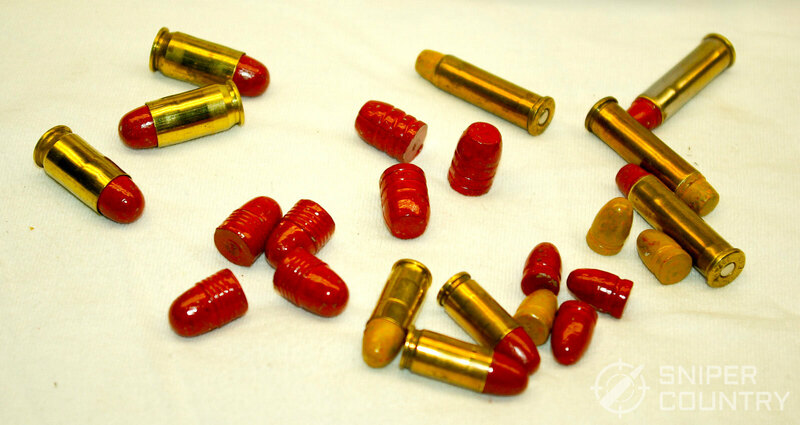 I was a skeptic at first, but now I coat all my cast bullets. The benefits are worth the time and investment. A very thorough discussion. Sounds like a pretty good way to go. I appreciate the little tips, like how long to let the bullets cool out of the oven. 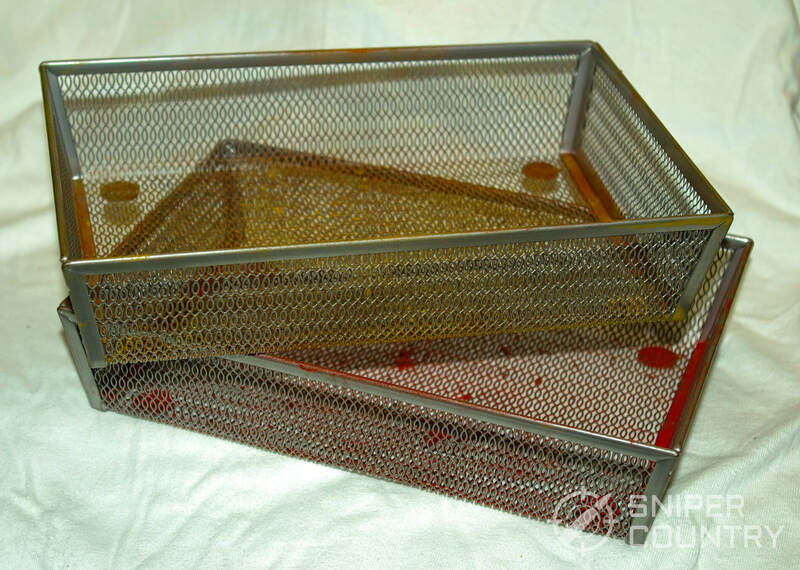 It surely isn’t hard or complex…you just have to get the paint to stick to the bullets, and, after “baking”, let them cool enough to bounce them loose in their tray so they don’t weld themselves to the mesh. You’d figure it out the first time. Thanks for the comment! Powder coating is the best hands down…….. harbor freight powder works but an outfit called Eastwood has the best virgin coating… and so many colors to choose from.. I personally use gloss black only and it is way more durable than Harbor Freight powder.. I ought to know because I have given all the coated bullets the sledge hammer test… and this is the best!!!! That’s great that you found a durable-coating paint. I know that Eastwood makes good stuff…it’s just that the HF stuff has worked well for me and I can walk into our local store and pick it up. There IS something to be said for the availability of many colors, though…maybe baby blue would look nice, all lined up in the pistol’s magazine…I digress. Gloss black tells me at least that you mean business! Keep up the good work – thanks for responding! Thanks.. I was searching for the best powder to coat reloads and this answers my question. I still have a bit of Harbor freight to use up but will move to Eastwood for the future needs..
Can the harbor freight be mixed in with the Eastwood powders to improve performance.? That’s a good question. I would assume, since both brands are basically just powdered paint, that you could combine them. The only thing that might happen is that they could coat the bullet differently, and you end up with a splotchy bullet. Certainly no harm in trying – you’re not going to raise pressures or anything like that. If you try, leave another comment with the results…thanks! That sounds great…both of those rounds would produce prodigious leading with softer bullets and traditional lube. I’m assuming you’re talking about Eastwood gloss black? I may have to try it. It sounds great for midrange .44 Magnum loads. Thanks for your comment! 100% correct. Eastwood powders are far better than any others. The few extra dollars isn’t even relevant considering the number of bullets it will coat. Eastwood is also a great company to do business with. One thing that you can do to clean any lead residue from your barrel when shooting cast bullets is to add a brass or copper jacketed bullet every now and then to your magazine.. It seems to pick up any bits of lead that a cast bullet might leave. Just a heads up for easy cleaning. Bill, I’ve used that method for years. 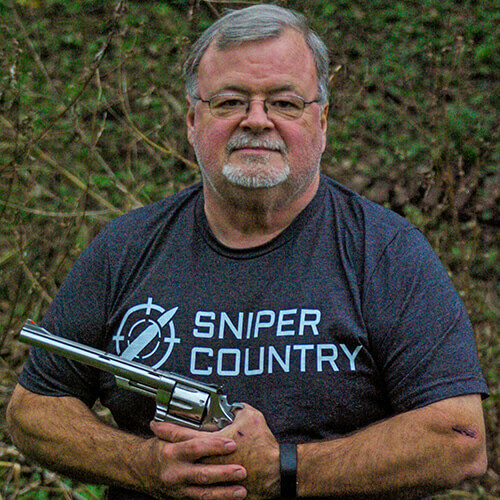 It seems the shooting community is divided on it…some claim that all you do is “iron” the lead deeper into the grooves with the jacketed bullet, while others (including Hickok45 – check out his video on the subject – claim that it works and has worked for years. I’m not going to tell you one way or the other…like I said, I’ve done it but I also use the “Chore-Boy-wrapped-around-a-brass-brush” method of getting the lead out, too. Thanks for commenting! I always lightly lube and size my cast bullets, but I didn’t read anywhere that said you size the bullets before or after powder coating. Do you need to size them? Lloyd, not usually. Lee tumble lube dies throw bullets very close to the correct sized diameters without sizing and the powder coat doesn’t add that much. I’d rather shoot a bullet a thousandth oversize than undersized…it keeps leading down.. Thanks for your reply! If you do have a leading problem there is a simple home brew solution. A 50/50 mix of white vinegar and hydrogen peroxide. Tape or plug bbl. pour in solution let soak, time can vari depending on level of leading. I was skeptical of this as I came across it on the internet (it must be true). I mixed up a small beaker full and dropped in a 38 spl. Almost instantly bubbles started rising off the slug. after about 10 minutes the slug was lighter by 10 grains.